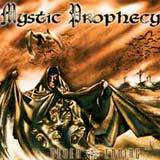 Mystic Prophecy is back with their third album. Like Regressus and Vengeance, the guys continue to release quality albums. As a side note, Guitarist Gus G. has recently left Dream Evil to concentrate on this band, much to the dismay of Dream Evil fans. Back to Never-Ending: if you like the band's previous work, or Power Metal in general, this album is one that you should look into. The most refreshing aspect of the band's music for me is lead vocalist R.D. Liapakis. His voice is miles away from the high pitched, happy power metal delivery that is commonplace in the genre. Instead, R.D. displays power in the low and middle octaves, as well as the higher ranges when needed. Additionally, his voice has a very slight raspy quality, which gives the music a harder edge. As with the band's previous work, R.D. nails down these tracks with power, melody, and emotion; a great fit for the music being performed. As for the music, the guitar work seems a little bit more thrash inspired this album. While the band's sound is still firmly planted in power metal and traditional heavy metal, some of the riff patterns and drumming have a discernable thrash influence. I enjoy this facet of the sound, as it gives Gus G. and the rhythm section more of an opportunity to utilize their musical ability. The rhythm section is intricate and spot on, providing a nice backdrop for Gus' sharp riffing. In all this, I do feel that the music has lost some of its melodic quality since the previous album. Several songs from Regressus jumped on me after the first listen, but Never-Ending didn't have that effect on me. Don't get me wrong, this is a good album, but I suspect that it will take longer for it to absorb that did its predecessor. As for the production, it is crystal clear, just as an album of this nature demands. On a whole, I feel that Never-Ending is a well performed album. R.D. Liapakis puts forth another All-Start effort, while the musical performances sound like they come from talented, seasoned verterans of the metal scene. I can't point out a bad or dull song, but on the other hand, I can't point out any killer songs either. The whole album goes by, and I am impressed very much with the vocal performance, the guitar work, and the energetic and pounding drum work. However, none of the songs as a whole is all that memorable for me. The album is very consistent, you can listen to this album from start to finish in your car or while you're on your PC, and I can tell you that it will be an enjoyable listen, without having to skip any "dud" tracks. However, after the end of the album, you won't feel the incurable need to play the album again. The songs are just missing that special something that elevate an album to the next level and leave a strong impression upon the listener. Like I said, there are no flaws to be found musically, and a consistently "good" quality is maintained throughout. In light of this, I can easily rate this album as "good," but no more than that.